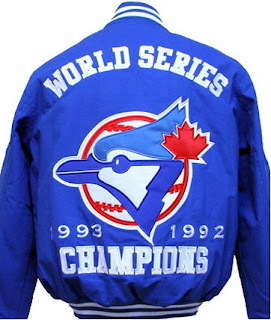 Ruben's Baseball: Blue Jays blockbuster = 2013 World Series? Blue Jays blockbuster = 2013 World Series? I just wrote a post on my Baseball in Alberta blog about what impact the Blue Jays trade could have locally. As a Red Sox fan, I realize that it impacts our team as well, so I am reposting here, with a few edits. Our division rival, the Toronto Blue Jays pulled off a blockbuster deal and have added 4 all-star players to their roster. Money aside (Rogers still has a few excess billions), the only cost was a controversial shortstop (whom will be replaced by one of the premier shortstops in the league), an under-performing pitcher and some prospects. And although some of these prospects might pan out in future years, it’s not as though any of them were the kind of prospects that your average baseball fan was following in the minors – a la Bryce Harper or Jesus Montero. In fact it wasn’t even the top organizational prospects – but their consensus #2, 5 and 8 guys. This trade will make Toronto a better team for the immediate future. It may even help their chances of making the playoffs, but we're jumping to conclusions if we assume any more than that. Remember how we felt when we added A-Gon and Carl Crawford to our already potent lineup? It was a foregone conclusion that we would win the division, most of the chatter around the baseball message boards was if we would break the 100 win barrier or not. Anyhow, there are two ways we can look at this: Look at individual player's impacts, or look at what history tells us about the fate of teams that made huge acquisitions, bolstering their rosters in hope of attaining that elusive championship. Today I'm going to start by looking at history for some parallels. In my next post, I'll analyze this specific trade more closely. Next we have the New York Mets. In 2000, they won the NL pennant and faced the Yankees in the World Series. But in 2001, barely finished at .500 with an 82-80 record while the Yankees went to the World Series again. Something had to be done to get back to relevance with the New York media. So that offseason, they traded for all stars David Justice, Roberto Alomar and Mo Vaughn. Justice's best years were behind him, but Roberto Alomar had just come in 4th in MVP voting, and was named an all-star for the 12th season in a row. And although Mo Vaughn was a few yeas removed from being the league's MVP, he had hit over 30 home runs 6 seasons in a row and was still a legitimate power threat. So, how did these acquistions work out for the Mets? They won 75 games the following season, and it wasn't until 2006 that they climbed back to .500 with an uninspiring 83-79 campaign. The Detroit Tigers flirted with success in the mid 2000s. They went to the World Series in 2006, and missed the playoffs by 6 games in 2007. Wanting to get back to the postseason, they upgraded by signing 5 time all star shortstop Edgar Renteria, and trading for Miguel Cabrera and Dontrelle Willis. Cabrera was every bit the player he is now having garnered MVP votes in all 5 of his seasons, and Willis was coming off a down year, but he was a very exciting 25 year old, with 2 all star appearances and a 2nd place finish in the Cy Young race on his resume already. Everyone handed the Tigers the AL pennant after that trade. How did it turn out for them? Well, with the help of Miguel Cabrera they returned to the World Series THIS year but in 2008, they scraped together all of 74 victories. The big splash they made, resulted in them going backwards. In 2008 the Mariners only won 61 games. In 2009 they had improved to 85 wins and Felix Hernandez showed the potential everyone thought he had, coming in 2nd for the Cy Young. The AL West was within reach. They resigned starter Erik Bedard and shocked everyone by acquiring Cliff Lee, who was only 1 year removed from a Cy Young, from the Phillies. With that starting pitching they were going to be a force to be reckoned with in 2010. Well, they won all of 61 games and haven't been relevant since. Agon, Crawford, yada yada, I don't even want to write about it anymore. Thank goodness for the Punto trade, that's all. The California Anaheim Los Angeles Angels of Anaheim won the World Sereis in 2002. They also won the AL West in 5 of the 6 seasons from 2004 to 2009. But in 2010 they stumbled to an 80 win season, and bounced back a bit to 86 wins in 2011, which still left them 5 games short of the playoffs. So they went out and spent some money to ensure a return to the playoffs. Within a 24 our span, they signed Albert Pujols and CJ Wilson committing well over $300 Million to the pair. Pujols is 3 time MVP and a certain first ballot Hall of Famer,and Wilson was coming off an all star season where he ended up 6th in Cy Young voting. More importantly, Wilson left the Rangers whom the Angels finished second to. This should have been enough to propel the Angels past the Rangers and into the playoffs in 2012. Well, they improved by 3 games winning 89 and ended up 4 games short of the playoffs. Not too different from their 2011 results and most of their improvement can probably be attributed to Mike Trout. After the 2011 season, the Marlins got ready to move into their new state-of-the-art stadium in Miami. And it looked like it was a good time to make a move in the standings. The NL East included perennial cellar dwellars, the Washington Nationals and the New York Mets and it looked like the Phillies window of opportunity was closing. With a 2nd wildcard added into the playoffs, and with other wildcard contenders such as St. Louis and Milwaukee weakened with big offseason losses, Miami could try and capitalize. Within a one week span, they signed Heath Bell to be their closer, Jose Reyes to be their dynamic leadoff hitter and shortstop and Mark Buerhle to bolster their starting rotation. Later on they traded for Carlos Zambrano. And the result was a 69 win season, their worst this decade century millenium! In all of the above the team's fan base, as well as the national media proclaimed the moves as huge game changers. The franchises in question were sure to reap immediate as well as long term rewards from their new shiny acquisitions. And it has never paid off. Blue Jays blockbuster = World Series?